(November 16, 2000) On Monday November 13, 2000 at approximately 9:30 p.m., a volley of gun shots pierced the night in an upscale part of Belmont Shore along Ocean Blvd. just east of the Belmont Pier. The gunfire was so loud it was recorded on a nearby security system. LBReport.com has obtained a copy of portions of the security system's audio recording and posts an audio excerpt of the gunshots below, so our readers can hear exactly what this LB neighborhood heard. 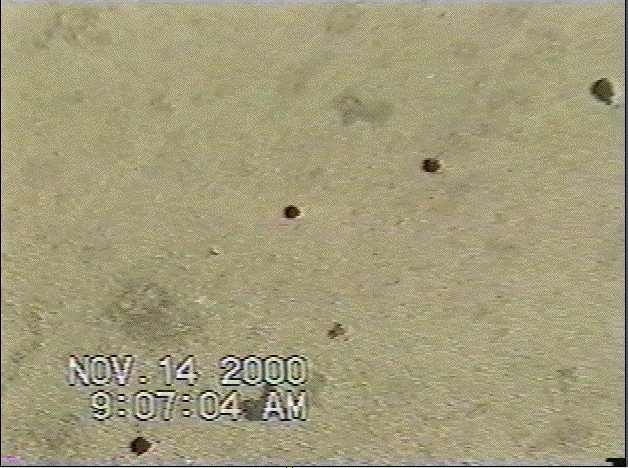 LBReport.com has also obtained a copy of portions of a videotape made the next morning by an area resident to document a blood trail visible along the north sidewalk of Ocean Blvd. The videotape does not conclusively show the blood trail is related to a wound from the gunfire. LBPD has told LBReport.com it is "reasonably certain" the blood is not related to the gunfire (details below). However, we are posting digital still photos made from the video, below, appropriately qualified as inconclusive of a gunshot wound, but nevertheless illustrative of neighborhood quality of life impacts. The gunfire broke out east of the Belmont Pier in the 4100 block of east Ocean Blvd. Police showed up in force with roughly half a dozen LBPD police cars. LBPD Public Information Officer Sgt. Steve Filippini told LBReport.com officers were on scene for over an hour, took some assault with deadly weapon-type reports, cleared the bar, conducted a search, found no guns and made no arrests. Filippini said one person was hit by a beer bottle and treated by paramedics at the scene for a cut behind the ear. Filippini said LBPD had also spoken to witnesses and area hospitals and was "reasonably certain" the blood trail is not related to the gunfire. Filippini did not suggest the blood trail was caused by the cut ear. However, he declined to provide further details on the gunfire incident or its investigation. An area resident has provided LBReport.com with a copy of a security-system's audio recording of the gunfire. We post it below in a .wav (simple audio) file. Most computers should be able to play it. Voices in the background are part of the call to police. After you click on the .wav (audio) file below, your computer may take a few moments to initialize. Your computer may then (a) play the audio for you immediately or (b) invite you to download the file to disk so you can play it later using your system's audio player (which is usually built in). Once the file is downloaded, click on it and hopefully it should play. The .wav file is roughly 209 kB and runs about nine seconds. For reasons unknown to us, some computers may automatically repeat the audio segment. An area resident has also provided LBReport.com with a video tape made the morning after the gunfire to document a blood trial visible along the north sidewalk of Ocean Blvd. The photos are digitally freeze-framed from the video tape. Because they are graphic, they may take a while to load. 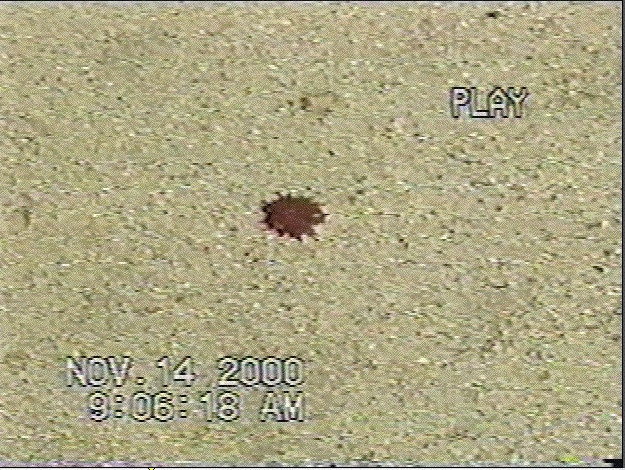 This blood spot, and others, were videotaped by a resident on the north sidewalk of the Ocean Blvd. The videotaped blood trail appears to extend roughly a block westward along Ocean Blvd. 's north sidewalk. LBPD says it's "reasonably certain" it's not related to the gunfire. A security camera did not capture the actual shooting which was outside camera view. LBReport.com intends to follow this story, both as a crime issue and a neighborhood quality of life issue.